In terms of dates the Combined Driving is a newer sport in the U.S. horsemanship world, but in terms of history, it is not. In 1970 Prince Philip, after retiring from playing polo, developed the first International rules for Combined Driving which were set in play at the Royal Windsor Horse Show. The sport has roots in the maneuvers military teams cross country and in crowded spaces, the elegance of the days before our highways were filled with cars, and the excitement of an old western stagecoach run. 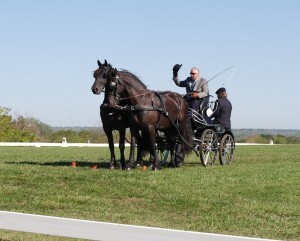 The Combined Driving sport in America grew out of the efforts of the American Driving Society which was established in 1974 to create guidelines for judging driving skills and driving horses. Until that time the Carriage Association of America placed important emphasis on the restoration and turn out carriages and horses but did not have a huge interest in how the teams were driven or how well they handled. The ADS developed rules and patterns which they submitted to AHSA (now USEF) for the rulebook in 1975/76. Then they wrote a guidelines pamphlet and pointed officials. ADS was a small group of people who were devoted to the love of driving. Around the same time Philip Hoffman purchased a 4 in Hand and went to England where he met HRHPrince Philip who was helping to develop his new love Combined Driving. Combined Training (3 day eventing) rules were used as a structure for the new Combined Driving Event. Philip Hoffman liked this new idea and brought it back to America where he became the first president of ADS. He organized the first Combined Driving Event (CDE) in Bedminster, New Jersey. This first effort had the ripple effect and now CDE is help throughout the U.S. The first handbook that ADS published only contained the rules for pleasure driving so the combined driving rules where published in prize lists and were not always consistent. Around 1980 the suggested FEI rules were added to ADS pamphlet. CDE is not a huge sport like hunter/jumper or reining but the participants are dedicated horsemen and women. CDE competition offers a huge range of opportunities for participation from beginners through FEI and for all kinds of horses from minis to huge carriage horses. she’d competed in a Para equestrian CDE. 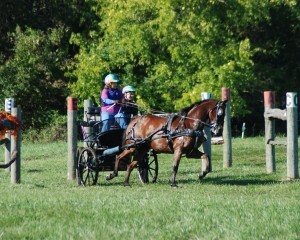 A former eventer, Pam had MS. She told me that as long as “they” could get you in a cart you could keep going in CDE! Not unlike a 2 day CT, this CDE had the dressage and the agility tests running simultaneously. The first thing you notice about the dressage test is the huge arena, which makes sense when you consider a horse or horses and carriage have to navigate this area following a prescribed test. At 40 x 80 meters it is twice the size of the small 20 x 40 meter dressage arena used for eventing. In dressage the horse is tested for obedience and suppleness while the rider is scored on their skills. Just like eventing tests there are multiple levels of dressage tests and each horse is scored according to its level and division. Turn out is elegant for dressage. The agility test (called Cones) for CDE is comparable to stadium jumping in eventing only the driver must maneuver the horse through a series of “gates” which are defined by cones with balls on top of them. As the horse progresses up the levels in his career the space between these cones becomes less. The slightest bump will cause a ball to fall from a cone which adds 5 points to the score and just like eventing, low score wins. There can be up to 20 sets of cones or gates to navigate. After a section that is quite like the old roads and tracks, comes the marathon which is the cross country equivalent for CDE. And just like eventing, the marathon brings out the competitive best. Off come the elegant black and whites from dressage and on go the colors, the helmets and the high powered tough terrain vehicles. The obstacles are called hazards and the drivers weave their horses in and out up to 6 different gates, labeled with letters. The hazards must be completed in a certain time which has to be balanced with overall time. Sometimes you wonder how the horses make the turns or how their navigators stay on. The navigator is a person who stands on the back of the carriage and helps the driver with directions They are also very helpful for weight displacement on fast turns! And just like in eventing we stationed ourselves by the water hazard. The internet is loaded with information about CDE. I’ve included links to a few but a quick search will reveal many more sites. And don’t forget to visit you tube for exciting videos of CDE coast to coast and all over the world, or take a look at the two below. And if you compete in this exciting sport write and tell me about it. Send a picture, too! Thanks for reading U.S. Horsemanship!